I love to 煲汤 (Po Tong in Cantonese), which usually takes more than 2.5 hours of slow simmering to extract the goodness from the ingredients and into the soup. Living in such a hectic society, the hours of simmering the soup may sound tedious, but it is worth the while to input nutrients into our bodies to maintain good health. This Sweet Corn Pork Rib Soup is one of such classic Cantonese soup, which I have recently cooked for my family and friends. Using pork ribs, sweet corn, and a nourishing combination of dried scallops, wolfberries, and red dates, it creates a rich delectable concoction and homely taste. If you are health conscious, a finding I got from the scientists from Cornell university states that “When sweet corn is cooked, it releases a phenolic compound called ferulic acid. And what you are losing in Vitamin C, you are gaining in ferulic acid and total antioxidant activity”. I hope my favourite brother-in-law is reading this as he graduated from Cornell University. Hahaha! Rub 2 tablespoons of salt to the leg bones and the pork ribs. Let rest for 10 minutes. 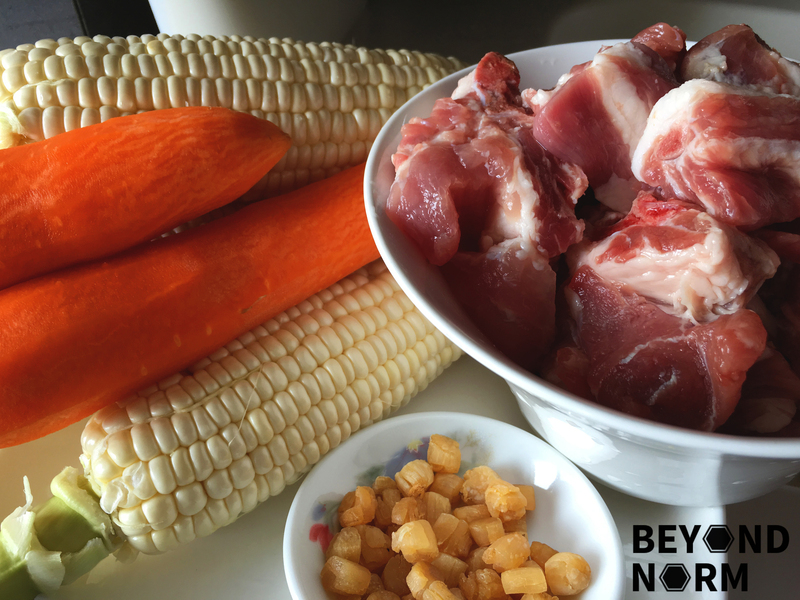 Boil some water in a pot, then add in the bones and the pork ribs. Blanch them. Next, wash and drain the bones and pork ribs. Set the pork ribs aside for later use. Rinse and soak the dry scallops with some water for about 5 minutes. Wash, peel and cut the carrots into chunks. 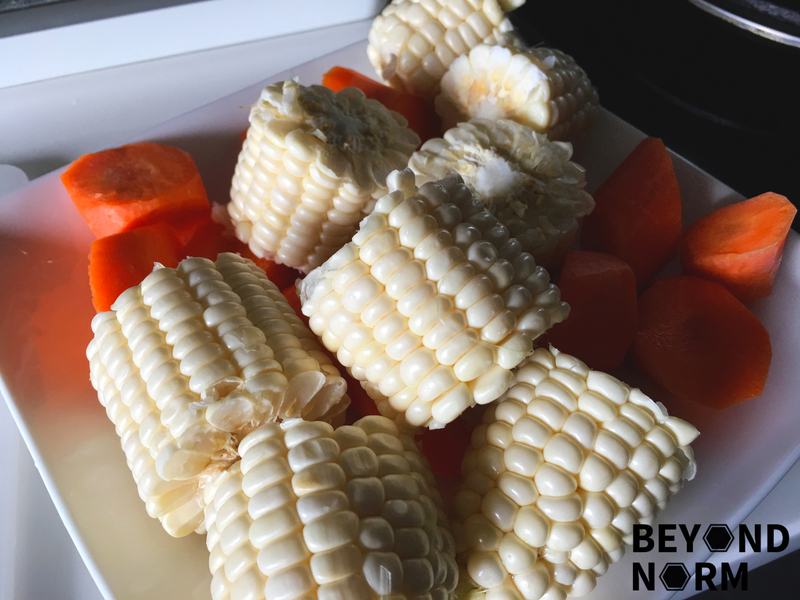 Cut the sweet corn into 3 to 4 pieces. Add the 12 cups of water and the leg bones into a pot. Bring it to a boil. Skim off as much of the impurities from the stock as possible. Then lower the heat and simmer for 2 hours. After the 2 hours, add in the pork ribs, carrots, scallops and sweet corn. Bring it to a boil. Then lower the heat and cover the pot with the lid. Continue to simmer for another 1 hour. If need be, leave a small gap between the lid and the pot so that the water will not overflow. Thereafter, add in the red dates and wolf berries. Then simmer for another 10 minutes. Distribute the soup into soup bowls and garnish with chopped spring onions. Your soup is not ready to be served!